Welcome back to the Battle for Azeroth Community Opinions series. This series will span the Battle for Azeroth Alpha and will cover multiple topics. We will focus on a specific topic every week and for this week, we’ve decided to delve into the Monk specs! Please remember that these are opinions. You may not agree with the opinions stated in this article and you are welcome to your own opinion to the state of the class and spec. Please feel free to leave any feedback regarding this type of article in the comments. Battle for Azeroth is currently in Alpha and things are subject to change at any point. Targets affected by Keg Smash will also burn, for (97.2%taking (19.656% of Attack power) Fire damage over 8 sec.and dealing 5% reduced damage to you for 12 sec. A fast and efficient spell, healing the target for (200%40.95% of Attack power). Gift of the Ox When you take damage, you have a chance to summon a Healing Sphere visible only to you. Moving through this Healing Sphere heals you for (750%81.9% of Attack power). Ironskin Brew Increases the damage you delay with Stagger by an additional 35%30% for 6 sec. Keg Smash Smash a keg of brew on the target, dealing (670%85.995% of Attack power) damage to all enemies within 8 yds and reducing their movement speed by 50%20% for 15 sec. Reduces the remaining cooldown on your Brews by 4 sec. Purifying Brew Clears 40%50% of your damage delayed with Stagger. Stagger You shrug off attacks, delaying 40% of Physical damage, instead taking it over 10 sec. Affects magical attacks at 40% effectiveness.20% effectiveness. Tiger Palm: Damage increased by 200%.100%. Breath of Fire: Cooldown reduced by 3 sec. Keg Smash: Reduces the remaining cooldown on your Brews by 2 additional sec. Ironskin Brew: Pauses Stagger damage for 3 sec. Purifying Brew: Grants you a stack of Elusive Brawler. Chi Burst Hurls a torrent of Chi energy up to 40 yds forward, dealing (503.25%65.52% of Attack power) Nature damage to all enemies, and (412.5%67.5675% of Attack power) healing to the Monk and all allies in its path. Eye of the Tiger Tiger Palm also applies Eye of the Tiger, dealing (172%28.1736% of Attack power) Nature damage to the enemy and (172%28.1736% of Attack power) healing to the Monk over 8 sec. Tiger Tail Sweep The cooldownIncreases the range of Leg Sweep is reduced by 15 sec.by 2 yds and reduces its cooldown by 10 sec. Special Delivery Drinking Ironskin or Purifying Brew has a 100% chance to toss a keg high into the air that lands nearby after 3 sec, dealing (243%32.76% of Attack power) damage to all enemies within 8 yards and reducing their movement speed by 50% for 15 sec. Fit to Burst Keg Smash clears 3% of your damage delayed with Stagger, and Keg Smash deals an additional 231 damage.69 damage. Swift Roundhouse Blackout Strike has an additional 5% chance to critically strike, and deals an additional 125 damage. Hello everyone! My name is BrewingScribe, a long-time theorycrafter for Brewmasters. I’ve been at this whole business since the Mists of Pandaria beta, and I’ve been a writer and maintainer of several guides, including the Legion Brewmaster guide here on Wowhead! Feel free to check me out on Twitter, as @BrewingScribe! Enough about me though, let’s get into BrM in BfA! The first thing to note about Brewmasters is that they are very similar to what they are right now in live, with a couple points of rebalancing. The most significant of these are the slight reduction to stagger from Ironskin Brew (30%, down from 35%), and how much magic damage is staggered compared to physical (20%, down from 40%), as well as buff to the amount we purify with Purifying Brew (50%, up from 40%). Both brews now have a shared cooldown of 16 seconds, down from 21. There has also been a sizeable damage reduction on the bonus damage to Tiger Palm via Blackout Combo (100% bonus damage, down from 200%). Overall, I wouldn’t worry about the balancing yet, as every tank’s capacity to deal with magic damage has been reduced and Tiger Palm isn’t hitting as much like a wet noodle as you would expect with a change like that on top of losing Face Palm, as its baseline damage has been scaled to be stronger than it is relative to other abilities in Legion. Besides, it’s still alpha, and fine-balancing is not something that will happen til beta and live anyway. In general, the removal of our artifact traits hasn’t particularly done much to us. Dragonfire Brew and Hot Blooded have been mostly rolled into Breath of Fire, whose DoT reduces the damage dealt of targets by 5% and now has a 12 second duration. Face Palm is probably going to be missed a lot by the DPS junkies, though as mentioned, Tiger Palm’s relative damage per hit is higher in BfA than in Legion and there hasn’t been a real balance pass just yet. Many other traits were minor utility abilities or very behind-the-scenes defensive or offensive benefits that weren’t really integral to our playstyle or our kit. I don’t even think losing Exploding Keg will affect us that much, though I’m sad to see it go. The big exception is Obstinate Determination, an ability that is pretty easy to argue was overpowered, but provided a strong amount of self-healing that does feel missed with the current iteration of Brewmaster, especially against more challenging solo world content. We feel very reliant on healers, which many consider to be a notable weakness of ours right now in 5 man content, even more so in harder solo content. Our rotation hasn’t really changed much at all (though there’s little reason for it to, since we haven’t really received a significant rework! ), but with the removal of Sal’salabim’s Lost Tunic, filling the rotation has become somewhat harder. Having a generally filled rotation requires you to pick Chi Wave and Rushing Jade Wind to fill empty GCD’s. On top of having zero procs like Legion, all of this makes the rotation feel very simple. Whether you think this is a good thing or not will be up to you. Personally, I wish there was some more complexity and decision making for our rotation. With my current experiences in the alpha, I don’t think that we’re going to be straying far away from our current mindset of maintaining as close to 100% Ironskin Brew uptime as possible and then purifying when necessary after that. Some procs or things to react to in our main rotation would really help spice up the current moment-to-moment play. To discuss talents, overall the same sore spots in our talent list are still sore spots. I’m still not a fan of Chi Wave due to its inconsistency of self-healing in group content. Gift of the Mists and Light Brewing still feel like they will underperform if your priority is burst damage reduction, which has largely been what people have been preferring as a defensive priority within at least the Discord community. Despite the lower cooldown, because Ironskin Brew’s duration is back to 6 seconds and because we’re lacking the Brew Cooldown Reduction that we could achieve due to artifact traits, Light Brewing’s relationship with Black Ox Brew hasn’t really changed much. Because of the reduction to baseline Stagger and with how Mystic Vitality works, that talent feels like it should get some love or be redesigned / removed if buffing it would go against the current design direction for tanks. Its value is very small, giving at most 7.2% additional magical Stagger with every possible buff to Stagger you can get. Despite our lack of self-healing in alpha, I don’t know how much love Healing Elixir is going to receive. In more difficult content, its counterparts are more often picked due to their higher value against aggressive damage. Elusive Dance I think will continue to be a bit underwhelming, mainly because of the preference for staggering damage rather than purifying it (even with the buff to purifying with 8.0 as it stands) and that the bonus damage component will be shaky to maintain at a high degree with consistency due to its requirement of consistently purifying high Stagger in order to fuel it. Blackout Combo will still be competitive, even despite the nerf to its damage option, though I think there are some combos that need a bit of love. The purify, Keg Smash, and Breath of Fire combos are not currently considered to be that impactful and even with the nerf to the Tiger Palm combo I don’t think that will change, mainly since people pick it for damage, as High Tolerance generally provides stronger defensive value. I’d like to see more with this talent! There’s a lot of really awesome possibilities with it. At the same time though, all of our good talents are still around! With Leg Sweep now a baseline ability, the level 60 tier should feel a bit more competitive for people, which is good. With the changes from some of the Legion patches, the 90 tier should also definitely feel better than at the start of Legion. In general, nothing’s changed too much with regards to talents, coming into the alpha as of today. Overall, Brewmaster in alpha is pretty close to its iteration in Legion. It’s got some rough spots in its talent setup and its self-sustain, but overall I don’t think Blizzard needs to start from the ground up with Brewmaster. The foundation from Legion is solid, it just needs to be touched up a bit. I’d personally love to see some more self-healing come into our kit. Not even a lot, because I know that it would be pretty darn imbalanced, but getting a bit more would certainly help a lot for small group or solo content. Brewmaster Monk changed a lot going into Legion but looks to remain mostly the same as we enter BFA. All of our core mechanics are largely unchanged outside of some numbers changes. I’ll be exploring some of these changes, the loss of our artifact and legendaries, discrepancies in talents, and the general state of the spec when it comes to M+ and raiding. To begin with I’ll be talking about Brews and Stagger, the center of the Brewmaster spec since that underwent major changes in Legion. For the most part we are not seeing much in the way of changes aside from small numbers tweaks when it comes to how they affect our play. A duration decrease on Ironskin Brew from losing the artifact is mostly offset by a reduced CD on brews, Purifying Brew is moving back up to 50% from 40% which more than offsets the loss of trait there as well. Our brew generation will drop by a noticeable amount due to the loss of Face Palm’s extra .7s per Tiger Palm and Stave Off’s extra .8s per Keg Smash, but it shouldn’t be enough to seriously damage our survivability in most cases. Stagger also remains mostly unchanged except that its reduction of magic damage has been halved from Legion, going from being 40% effective against magic damage to 20%. This is a pretty major concern for Brewmaster, especially in fights like Star Auger in Nighthold or Ivanyr in the Arcway where essentially all damage you take will be Magic Damage. Most tank specs are losing their constant magic mitigation in some way or another but Brewmaster does not have many significant cooldowns or self healing to defend against this fact while most other tanks do. In raids this should not be a huge problem since having multiple healers to share the load should still pair well with our relatively low constant intake. In M+, however, the biggest weakness we have is getting even weaker. Brewmaster rotational abilities have seen almost no changes except to their numbers once again but are greatly affected by the loss of our artifact and legendaries. The biggest change here is the loss of several artifact traits and the incorporation of one. Breath of Fire’s DoT effect now reduces damage done to you by the targets by 5%, equal to rank 5 of the trait Hot Blooded. None of the other effects have been retained including multiple modifiers to Blackout Strike, Stave Off’s chance to proc extra Keg Smashes, and one of the biggest ST damage traits in the game, Face Palm. Losing Face Palm’s average of 2.4x modifier on Tiger Palm is an absolutely massive loss in relative power as it was that trait when combined with Blackout Combo’s 3x modifier to Tiger Palm that made Brewmaster ST DPS competitive with the other top end tanks. Blackout Combo’s increase to Tiger Palm has also been reduced to a mere 100% increase which means we are going from dealing an average of 7.2x our normal damage to only dealing 2x our normal damage. While those changes will affect us in every facet of the game while other trait losses will be felt quite heavily in M+. Losing the Smashed trait restricts Keg Smash to a 15 yard range, down from 25, which leaves us in a bad spot when it comes to kiting in M+. Our ability to pick up enemies is already very low, since we don’t always want to slow them and Keg Smash being on a prohibitive CD for gathering loose enemies. We now will have to stay much closer to continue putting out damage and keeping threat which puts us in the danger zone for a lot of abilities that we could normally outrange. To make this worse, Brewmaster essentially has 30% increased movespeed fulltime in combat due to the trait Swift as a Coursing River which is going away. Our kiting ability is going to suffer for sure since we’ll have to rely on Roll and Transcendence to keep away from enemies. Mobility should still be a powerful tool for us though and kiting will still be totally possible in most situations but will be much more difficult in small areas. Losing our legendary shoulders Stormstout’s Last Gasp will make taking control of larger packs very difficult since that is our primary AoE threat generation and its radius already makes picking up enemies difficult. Losing Sal’salabim’s Lost Tunic causes the same issue but with the added problem that is will be much more difficult to apply our Breath of Fire DoT to everything we fight. Exploding Keg will be going away as well and it’s plain to see we have a huge hole to fill when it comes to add pickup. I don’t see a bright side here and this is my biggest concern of all when it comes to Brewmaster in M+. If we continue to see big pulls with many enemies being spread across multiple packs, Brewmaster isn’t just going to be weak but it won’t even be viable without a hunter to misdirect. This needs to be addressed before BFA launches. Beyond what they are losing, their issue with self-healing being extremely low is still very much the case in BFA. With the direction M+ has gone, needing a healer to tunnel into you full time on large packs and sometimes even smaller packs has made other choices far more attractive. Their talent choices for self healing, Healing Elixirs and Gift of the Mists are woefully undertuned and are completely ineffective when compared to their counterparts. If Brewmasters are to be competitive with other tanks in M+ they need to bring something more to the table like significantly higher DPS than other tanks, some sort of group utility, or they need to take much less damage. I think they do a good job of smoothing out massive hits, especially if they’re physical where they can shrug off attacks that punish other tanks pretty brutally. Those situations are commonplace in raids but are few and far between in M+, so it can’t be considered a proper form of utility that is strongly desired for a group in most situations. When it comes to raiding, the same tools that made Brewmaster so good are still in place. They should generally be strong all the time except against constant magic damage or when they become unhealable for any long stretch of time such as on Helya or Varimathras since Stagger becomes a burden instead of a helpful tool for smoothing damage intake. Their burst mobility is still among the best in the game and they force a ton of dodges in ST situations, especially in later tiers where mastery starts to scale to insane levels. Their biggest issue remains a lack of Cooldowns to cycle through consider Zen Meditation being extremely difficult to use effectively and Dampen Harm being a talent choice competing with Mystic Vitality, though that talent will also need to see improvements if it’s to remain competitive. I would not be surprised to see Brewmaster be a mid-tier tank or a more niche pick early on before becoming a monster as they are now late in the expansion because of how they scale off of mastery and are able to pick up trinkets to fill the gap in their cooldowns in the most common raid situations. Ultimately I think Brewmaster needs a lot of help in a few areas for M+ but are more than fine for raiding going into the next expansion. We need better ways to pick up groups of enemies that aren’t locked behind significant CDs and/or don’t slow them and make it even harder to group. Were we to see the return of Dizzying Haze in some form that made it so it wasn’t easily abusable in raids I think we would immediately be in a much better place. We need to bring more group utility than a 3 sec AoE stun and Ring of Peace as well as have better talent options for self sustain. Without those I don’t believe Brewmaster will see an increase in play from those looking to push as high as possible in M+. There is still much to see such as dungeon design, how other tanks play, and the still mostly unknown Azerite Armor. Hopefully we are able to get some help to counter some of the dire weaknesses that Brewmaster is currently plagued by without losing what makes them fun and unique among tanks. My name is Paoanii, and while relatively new to the Brewmaster theorycrafting team I have been an active member of many tanking communities for over 10 years and I am currently a Brewmaster moderator for the Peak of Serenity Discord. I generally like to explore tank survivability in a practical space rather than a theoretical one. In light of the relatively few changes on Alpha servers, it seems prudent to begin with the state of Legion Brewmaster. Legion Brewmaster finds itself currently in a very strong position among the tank specs. Most recently the spec has seen a significant surge in popularity both as a result of both the increased popularity of Windwalker Monks and the vaunted strength of Brewmaster on the Mythic Argus encounter. The strength (and weakness!) of Brewmaster on live comes from its unmatched ability to smooth out large spikes of damage with Stagger at the cost of requiring significantly more external healing compared to other tanks. Stagger allows Brewmaster monks to take only a small portion of a hit up front whilst taking most (70% in the current model) of the damage of the hit as a dot over the next 10 seconds. Due to the fact that we negate very little of the total damage of a hit compared to most tanks, Brewmaster is a very strong tank in a raid setting where available tank healing is a largely unlimited resource. However, it makes Brewmasters much more susceptible than other tanks to healing reduction/immunity mechanics (like Misery on Varimathras) and much weaker in healing-limited environments like high-end Mythic+ Dungeons. While Brewmaster is light on changes compared to many other specs currently, that is not to say it is completely lacking. Leg Sweep has been moved baseline and replaced with a talent that improves its functionality (Tiger Tail Sweep), which is a welcome addition to Brewmaster’s group utility. The Mystic Touch passive has been added, which increases physical damage for all group members on any target you have damaged. Magical Stagger has had its effectiveness halved, going from 40% of physical stagger amounts (56% with Mystic Vitality) to 20% of physical stagger amounts (28% with Mystic Vitality). Blackout Strike continues to generate stacks of Mastery: Elusive Brawler, however Breath of Fire does not. The change to damage calculation for melee dps and tank abilities means that we will no longer completely disregard weapon damage, which is a welcome change to aid our relatively low gear scaling. The existing Legion talent tree for Brewmasters has gone almost entirely unchanged in Battle for Azeroth so far. Despite the changes to brew generation brought about by the loss of our artifact and the cooldown adjustment to Ironskin Brew and Purifying Brew, Black Ox Brew continues to overshadow its competitors in the row due to its exceptional synergy with our kit and the energy provided by it which allows us to maintain a significantly net energy negative rotation for an indefinite period of time. The nerf to magic damage Stagger has caused the Mystic Vitality talent to fall into near irrelevance, making Dampen Harm likely the only viable choice in the row for group content even against magic damage due to the massive mitigation difference between the two talents. The level 100 talent row continues to be our most competitive one, however it is not without its own problems. The Blackout Combo talent seems intended to be the most versatile of the talents in the row, however the relative numerical weakness (and in one particular case: complete irrelevancy) of the various options within the talent has resulted in it only being used to buff Tiger Palm damage and occasional to pause the Stagger dot with Ironskin Brew. The combo benefit for Purifying Brew is the worst offender in this regard, offering a benefit which is neither numerically strong nor adding significant synergy with Purifying Brew itself. There are already existing purification benefits such as the effect on Gai Plin’s Soothing Sash or the Hot Trub honor talent which would make for strong (and fun!) options for a combo with Purifying Brew. While Blackout Combo is not without fault, the Elusive Dance talent is arguably the most problematic in the row. It is numerically strong; it is by far the best option for total damage mitigation over an encounter and offers strong burst damage (especially in AoE) when played around, which has led to its use in some M+ Dungeons. The talent however suffers from a design which puts damage optimization and mitigation optimization in opposition and offers benefits which are lost in a raid setting in which the size of your stagger dot is (generally) irrelevant compared to the impact damage of a hit. Base purification values are significant enough to keep Stagger from ever reaching supercritical levels in a raid setting (barring mistakes), so the increased purification is largely wasted. Many of the gameplay changes to Brewmaster in BFA have come from the loss of our artifact, Fu Zan, the Wanderer’s Companion. To compensate the loss of those traits, we have a number of changes to the baseline functionality of several abilities. We’ve seen the damage reduction from Hot Blooded and the duration increase from Dragonfire Brew rolled into baseline Breath of Fire as well as a significant cooldown reduction on Ironskin Brew and Purifying Brew to offset the loss of Potent Kick and the brew generation from Face Palm, Stave Off, and Quick Sip. The changes to Ironskin Brew and Purifying Brew, while mostly tuning focused, have a large impact on the pacing of brew usage and the availability of Purifying Brew as a defensive tool. I’ll reserve judgement on whether this change is positive or negative until I’ve had an opportunity to participate in raid testing, however the pacing difference is very apparent when compared to live. In addition to the compensatory changes so several of our baseline spells, we’ve also seen some of the quality of life improvements offered by our artifact removed. Notably the movement speed from Swift as a Coursing River and the additional range on Keg Smash from Smashed, while not numerically impactful, are absent entirely from Battle for Azeroth Brewmaster. Most impactful, however, is the loss of Obstinate Determination. The trait offered a significant influx of the self healing which Brewmaster is sorely lacking on both live servers and the Battle for Azeroth alpha at times when that healing was needed most. In conclusion, the Battle for Azeroth alpha has thus far held relatively few changes for Brewmaster Monks, although recent blue posts have indicated a potential for significant change to stagger and the Brewmaster mitigation model. Most gameplay changes so far have been subtle but significant changes brought about by the loss of Fu Zan, the Wanderer’s Companion and our legendary effects. Detox Removes all Magic, Poison, and Disease effects from the target. plus an additional (48%12% of Spell power) over 8 sec. Gust of Mists will heal affected targets twice. Castable while moving. Essence Font Each bolt of Essence Font heals a target for an additional (48%12% of Spell power) over 8 sec. Gust of Mists will heal affected targets twice. Fortifying Brew Turns your skin to stone, increasing your current and maximum health by 20%, and reducing damage taken by 20% for 15 sec. Life Cocoon Encases the target in a cocoon of Chi energy for 12 sec, absorbing 427) + 0)) * (1 + Versatility)] damage and increasing all healing over time received by 50%. Mastery: Gust of Mists Effuse, Renewing Mist, Enveloping Mist, and Vivify also cause a gust of healing mists, instantly healing the primary target for (0.01%0.1% of Spell power). Renewing Mist Surrounds the target with healing mists, restoring (700%175% of Spell power) health over 20 sec. If Renewing Mist heals a target past maximum health, it will travel to another injured ally within 20 yds. Revival Heals all party and raid members within 40 yards for (720%180% of Spell power) and clears them of all harmful Magical, Poison, and Disease effects. Effuse, Enveloping Mist, Vivify, and Life Cocoon also trigger Soothing Mist. After casting these spells, you continue to channel healing mists into the target, healing them for (64%32% of Spell power) every 0.51 sec, until you take any other action. Spinning Crane Kick Spin while kicking in the air, dealing 122%16.38% of Attack power)] damage over 1.50 sec to enemies within 8 yds. Vivify Causes a surge of invigorating mists around the target, healing them and their 2 nearest injured allies for (300%75% of Spell power). Invoke Chi-Ji, the Red Crane Summons an effigy of Chi-Ji, the Red Crane for 45 sec. Chi-Ji heals nearby allies with Crane Heal for (135%22.113% of Attack power). Invigorating Brew Vivify does an additional 616173 healing when empowered by Thunder Focus Tea. Swift Roundhouse Blackout Kick has an additional 5% chance to critically strike, and deals an additional 231 damage.125 damage. Hello there! I’m Anomoly. I am a moderator of the Peak of Serenity Discord and the current maintainer of the Mistweaver analyzer over at WoW Analyzer. I have played Mistweaver since Mists of Pandaria and am currently raiding in Decidedly Uncouth. “The current iteration of Mistweaver on Alpha has seen no changes,” that is how I would have started this a week ago. Since then Build 26433 dropped and Mistweavers got some changes. I say some, because it feels like we are just seeing a portion of where Blizzard is heading with the class in Battle for Azeroth. The below comments, therefore, are based on an incomplete picture of at least the initial direct Blizzard is taking Mistweavers in Battle for Azeroth. It looks like though, we are off to an exciting start. In general, the Mistweaver artifact, Sheilun’s Gift, provided a simple single target heal that grew in power over time while in combat. The loss of this ability, in general, has very little impact going into Battle for Azeroth. Our artifact ability provided a nice 2 second free heal that we could use to cover a larger hit, and regenerate some mana using the free heal. None of our golden traits are anything to be excited for and the remainder of our artifact traits generally provided some passive bonuses to the spells we cast. Our artifact largely won’t be missed moving into Battle For Azeroth. I do feel we will see some of these return as talents or something similar. With the initial Vivify changes in, I am hoping for an increase to the Renewing Mist duration, that was previously granted by Extended Healing. With a 23-24 second duration Renewing Mist, you can more reliably keep 3+ Renewing Mists out on the raid. Mistweaver have had a single talent change in Battle for Azeroth up to this point, Tiger Tail Sweep. With Leg Sweep moving to baseline, Mistweaver get the option of talenting into either a strong Leg Sweep or some additional crowd control. Based on the point above that it seems we are midway through the changes being rolled out on the alpha, and I am optimistic we should see some changes with multiple rows of our talents. Mistweaver’s have had little choice for the majority of Legion in terms of talents. Each row only has a single talent that provides any usefulness from a raiding perspective. On the 45 Row, Spirit of the Crane does provide some interesting gameplay around dealing damage, and regenerating mana. At 90, Refreshing Jade Wind, with the changes made in Patch 7.2.5, became our go to talent for any fight that you could reliably stack on. Almost every fight contains enough stacking to make Rushing Jade Wind the de facto choice, with Invoke Chi-Ji, the Red Crane used sparingly. Finally, the 100 row was dominated by Mana Tea, with Focused Thunder seeing use in Mythic+. The limited choice from a talents perspective was a big let down for most of Legion. I hope looking back on Legion, Blizzard takes this into account to rework or replace some of these lesser used talents to give some additional choices to Mistweavers for progression. It was great not to have to waste tomes swapping talents from boss to boss, but some sort of choice would have been nice. Mistweaver’s for most of Legion have felt like a forgotten class. We went through a major overhaul coming into Legion but those changes really never materialized into a cohesive class. The removal of Chi and Uplift from Warlords simplified our healing toolkit, and gave us our new AoE healing spells, Essence Font and Vivify. Soothing Mist stayed around, but only with a trickle of passive healing tacked onto our single target healing spells. Our Mastery: Gust of Mists was once again changed, this time to just a flat heal on top of our single target healing spells. With Battle for Azeroth, we are gaining some of our WoD spells back. Soothing Mist is now castable again, and makes Enveloping Mist and Vivify instant on your Soothing Mist target. Effuse has been removed, and Vivify now has the old Uplift effect built in, with additional healing being triggered on any player with a Renewing Mist buff on when you heal with Vivify. While being cautious, I think this is a great step moving forward. These initial changes really bring some interesting options and ideas to the class moving into Battle for Azeroth. With these being only a part of the overall changes coming, or feel like only part, I don’t have an opinion on how gameplay will change. The changes seem to provide some buffs to our 5 man potential with Vivify and Renewing Mist covering the majority of the group, allowing us to better heal through the AOE damage in dungeons. Also, the Thunder Focus Tea buff to Enveloping Mist gives us a strong single target heal, now that we have lost Effuse. One thing to not about the Soothing Mist change, this is hopefully tied to some addition changes or talents. Currently there is little reward for casting Soothing Mist, and then following up it with either Vivify or Enveloping Mist. With Soothing Mist triggering the GCD on cast, you would not gain the benefit of the instant cast Enveloping Mist or Vivify. This means that from a gameplay perspective, we more than likely won’t be spamming Soothing Mist. It would be a spell we can use when the target is going to take some constant damage over the course of those 6 seconds and will benefit from Enveloping Mist and multiple Vivify casts, along with the Soothing Mist healing. With these initial changes coming in for Mistweavers the future looks different and a little bit the same. There are Warlords of Draenor concepts coming back into the class, which is exciting for those that played during that time. I am looking forward to see the next alpha build and what direction Blizzard is taking us with our new talent changes and potential additional spell changes. We can be patiently optimistic that Blizzard is setting us up to play better than we did in Legion. Hi, I’m Dhaubbs, the Mistweaver and videographer for Big Dumb Guild. I’m also a moderator in the monk discord Peak of Serenity, as well as an occasional spreadsheet tinkerer. You might also recognize me from an appearance on Finalboss. Check me out on twitter & twitch @Dhaubbs where I wax lyrical about this class. So Mistweaver has been in a weird, unintuitive spot for most of legion. The ambitious redesign of the class attempted to retain the flavour of old spells, but just missed the mark on their implementation. The team tried to keep iconic spells such as Soothing Mist by making it free. The problem with this is in order to balance a free 5 minute channel, mana costs of our other spells needed to be inflated to compensate. As such, Mistweaver is designed around a certain amount of dead time. However Soothing Mist is too weak to ever be a good cast (if damage on the target is light enough for Soothing Mist to make a difference, then you should be DPSing anyway) and as such, the correct talent pick for raiding was nearly universally Spirit of the Crane. This talent at least gives us some HPS return on the forced downtime. Paradoxically, a large number of our spells are only efficient through repeated spam casts, or buffs. Take Enveloping Mist – on its own it’s wildly inefficient, and depends greatly on repeated additional casts to take advantage of it’s 30% healing bonus to break even. Or take Essence Font – It gains no benefit from mastery, unless we pump yet more spells into targets with the Essence Font HoT (HoT chasing). Finally if that wasn’t enough, Vivify isn’t an efficient cast unless under the effects of Mana Tea or Uplifting Trance. All of the examples above, are situations in which the Mistweaver is forced into casting overcosted spells over and over in order to gain the benefit from their designed interactions, leaving no room for the mitigating factor of Soothing Mist. Finally, I’d be remiss if I didn’t mention it, but our mastery is an absolute farce. Every other healer has a mastery that multiplicatively affects their spells. Ours is just a flat spell power value, and while that’s not bad necessarily, the problem arises from its implementation. Because our mastery only triggers from our single target spells (the overcosted inefficient spells I mentioned), it doesn’t affect 50-70% of our raid HPS. Not any of our golden traits, revival, Chi Burst, RJW, or Essence Font which doesn’t see a mastery benefit until 6 seconds after casting, if at all. Mistweaver has seen some pretty healthy changes in terms of design on the Alpha. Quick TL;DR – Sheilun’s Gift and Effuse are removed, Vivify’s mana cost was reduced by 20% and now only cleaves onto Renewing Mist targets, and Soothing Mist is once again an active spell that costs mana. So let’s talk about the star of these changes at the moment: Soothing Mist. It’s just super efficient now, as well as allowing you to instantly cast Vivify and Enveloping Mist. In one swoop it went from being a spell meant to bait new players, to a powerful workhorse. For context, if you cast both Soothing Mist and Enveloping Mist into a target, the Soothing Mist heals for more than the Enveloping. Now, it’s alpha and numbers are likely to change, but currently, Soothing Mist is in a spot where it’s allowed to be good. In the past, it needed to be weak since it generated chi directly, then it was used to facilitate spells that generated chi, then finally in legion, it needed to be weak because it was free, and lasted 5 minutes. Now the design space is such that it can be its own thing. Whether this is a good or bad thing remains to be seen, since it does create some weird and potentially awkward GCD usage, but for now it feels pretty good in low level dungeons. Finally, the removal of Effuse and Sheilun’s Gift. This is wonderful change. These two spells essentially locked Mistweaver into our terrible mastery. Our mastery, because it’s a flat heal, could never be “good” with cheap/free spells to trigger it. Now the only spells that trigger mastery are either expensive, or on a cooldown. This also has the ancillary benefit of slashing the total number of spells that can trigger our mastery by 40%, which makes it much more likely that Blizzard is going to take a look at it (since having a mastery that can only be triggered by 3 spells is a pretty big meme). I’ve got a lot more to say here but I’m running out of space, so I’ll just conclude by saying I’m pleased with the changes, they still need work, and some polish, but I’m excited for the direction Blizzard is going. Hello! I’m Garg (Twitter / Twitch), former Mythic raider in Temerity, and Mistweaver lead for the all monk site, PeakofSerenity, as well as Admin for the PeakofSerenity discord server. I built and maintain the Teachings of the Red Crane Mistweaver Spreadsheet, which ranges from providing stat weights, trinket comparisons, fight-specific legendary rankings, among other essentials for raiding Mistweavers. I also wrote the guides you can find on PeakofSerenity, and have kept the guides you can find here on Wowhead up to date. The removal of Sheilun, Staff of the Mists is not overly impactful, with the exception of a few key traits. With the iLvL squish Battle for Azeroth is bringing, all healing spells are being readjusted for the much smaller health pools and Intellect levels, making the majority of Sheilun’s traits that just give a baseline boost to the power of spells unimpactful. The traits that will be sorely missed will be Mists of Life and Dancing Mists, with an honorable mention for Blessings of Yu’lon. Mists of Life turns Life Cocoon into a much better single target cooldown, changing it from a bubble best used to prevent damage, into a bubble that can reliably provide a rather large amount of healing in an instant. This is due to the fact that, along with the stated Enveloping Mist and Renewing Mist applications, two Mastery: Gust of Mists heal the target. Both of which are buffed by Enveloping Mist’s healing bonus. Dancing Mists provided more Renewing Mists per fight, thanks to its relatively smart traveling mechanic. Going into Battle for Azeroth, though, we’ll be clamoring for as many Renewing Mists as possible, due to how Vivify has changed. If there were an award for it, Blessing of Yu’lon would win the “Best Spell Effect Seen by No One”, due to it summoning a massive projection of Yu’lon that the rest of your group could never see. In the latest Alpha (build 26433), Mistweaver received a number of significant changes to their base style of play, but with talents untouched, the bigger picture of Mistweaver going into Battle for Azeroth is still rather unknown. That said, there is still enough done to the base kit to get a decent idea. Effuse has been removed. Vivify has been turned into a combined version of Effuse and the old spell Uplift, healing a targeted ally, as well as healing each person with Renewing Mist active on them for a smaller amount. Soothing Mist has returned as an active spell (if you’re new to the spec, think of it like the PvP Talent Ancient Mistweaver Arts), allowing Vivify and Enveloping Mist to be cast instantly on the target, as well as providing a respectable amount of constant healing in the meantime. When used to empower Enveloping Mist, Thunder Focus Tea now heals for a relatively large amount instantly, as well as making it cast instantly. This gives it more power as a reactionary “oh crap!” button, which is the niche it had originally tried to fill with the Legion version of the Thunder Focus Tea empowerment, but fell flat on because it wouldn’t start healing until a little bit after the cast. However, with proper planning you shouldn’t ever have to use Thunder Focus Tea in this manner. Mystic Touch is a new Monk-wide passive, causing any damage the monk does to leave this debuff, increasing the target’s Physical damage taken from all sources by 5%. Spinning Crane Kick, any of the current Level 15 talent row (Chi Burst and Zen Pulse, notably), and Crackling Jade Lightning will be your quick applicators of this debuff. Battle for Azeroth is placing a more important role on using Renewing Mist as often as possible, in order to maximize Vivify healing, through both its cleave as well as the Uplifting Trance procs it provides. I’d love to see some of the under/never used talents (Chi Wave, Song of Chi-Ji, Rising Thunder) removed and replaced with meaningful options that provide effects similar to the meaningful artifact traits we’ve lost, or impact the way Renewing Mist interacts with the kit, like reintroducing charges via Pool of Mists. Another thing I’d like to see is a change to the Mastery, something that emphasizes the importance of Renewing Mist, like increasing its duration (and healing for a smooth scaling %) in order to have more available at a given time for Vivify cleave healing, or a Mastery that increases the Spell power of the Vivify cleave onto Renewing Mist targets in order to reward pressing Vivify by making it more powerful, or something entirely unrelated to Renewing Mist that instead affects more of the toolkit and won’t be as dead of a stat going into Battle for Azeroth. With the changes Mistweavers saw mid expansion with Essence Font getting a baseline buff and Refreshing Jade Wind becoming untethered from Essence Font, able to stand on its own, more and more total healing was not being affected by Mastery, making it a rather worthless stat in the end-tier of Legion raiding. To reiterate, the less our Mastery makes up in overall healing, the worse it is. With the addition of trinkets, tier sets, legendaries, and various other minor healing increases, Mastery’s overall contribution kept slipping and slipping, making it less appealing as the expansion wore on. Overall, I’m excited to see what the rest of the changes are for Mistweaver in Battle for Azeroth, especially the talents. The playstyle echoes some aspects of what I loved about the spec after playing it for so long prior to Legion’s rework of the spec. Just a couple more tweaks, as well as some meaningful talent choices, and this may be one of the best versions of Mistweaver yet. Windwalker Monk Apply Aura: Modifies Damage/Healing Done by 25% -5%. NEW Touch of Death Amplifier Increases damage done by Touch of Death by 10% of all damage you dealt to the target during the duration. Afterlife When you kill an enemy, you summon a Healing Sphere, healing you for (1200%196.56% of Attack power) when you walk through it. When you kill an enemy with Blackout Kick, you have a 50% chance to summon a Chi Sphere, granting 1 Chi when you walk through it. Fists of Fury Pummels all targets in front of you, dealing 573.4%94.185% of Attack power)] damage over 4 sec to your primary target and damage over 4 sec to other targets. Can be channeled while moving. Flying Serpent Kick Soar forward through the air at high speed for 2 sec. If used again while active, you will land, dealing (53.658%8.78918% of Attack power) damage to all enemies within 8 yards and reducing movement speed by 70% for 4 sec. Spinning Crane Kick’s damage is increased by 40%10% for each unique target you’ve struck in the last 1.50 sec with Tiger Palm, Blackout Kick, Rising Sun Kick, or Rushing Jade Wind. Spinning Crane Kick’s damage is increased by 40%10% for each unique target you’ve struck in the last 1.50 sec with Tiger Palm, Blackout Kick, or Rising Sun Kick. Touch of Death Use ancient Pandaren knowledge of anatomy to Inflict mortal damage on an enemy, After 8 sec, the target willcausing the target to take damage equal to 50% of your maximum health reduced against players.after 8 sec, reduced against players. During the 8 sec duration, 10% of all other damage you deal to the target will be added to the final damage dealt. REMOVED Chi Orbit Every 5 sec, an orb of energy forms, and rotates around you until it impacts an enemy, dealing (172%31.5% of Attack power) damage to all nearby enemies. Maximum 4 orbs. REMOVED Dampen Harm Reduces all damage you take by 20% to 50% for 10 sec, with larger attacks being reduced by more. REMOVED Leg Sweep Knocks down all enemies within 5 yards, stunning them for 3 sec. REMOVED Ring of Peace Form a Ring of Peace at the target location for 8 sec. Enemies that enter will be ejected from the Ring. REMOVED Summon Black Ox Statue Summons a Black Ox Statue at the target location for 15 min, pulsing threat to all enemies within 30 yards. You may cast Provoke on the statue to taunt all enemies near the statue. NEW Combo Breaker When Tiger Palm causes the Blackout Kick! effect, the cooldown of Rising Sun Kick is reset. NEW Fist of the White Tiger Strike your target with the technique of the White Tiger, dealing Physical damage to your target while generating 3 Chi. NEW Inner Strength Each Chi you spend reduces damage taken by 3% for 4 sec. NEW Tornado Kicks Rising Sun Kick strikes a second time for 25% additional damage. NEW Wind Strikes When you use Fists of Fury, you next 3 Tiger Palm attacks release a gust of wind that deals 52.65% of Attack power)% Physical damage to all enemies 8 yards in front of you. Ascension Increases your maximum Chi by 1, maximum Energy by 20, and your Energy regeneration by 10%. Chi Burst generates 1 Chi per enemy target damaged. Chi Torpedo Torpedoes you forward a long distance and increases your movement speed by 30% for 10 sec, stacking up to 2 times. Energizing Elixir Chug an Energizing Elixir, refilling all your Energy and instantly generate 2 Chi. Hit Combo Each successive attack that triggers Combo Strikes in a row grants 2%1% increased damage, stacking up to 6 times. Invoke Xuen, the White Tiger Summons an effigy of Xuen, the White Tiger for 4520 sec. Xuen attacks your primary target, and strikes 3 enemies within 10 yards every 1 sec with Tiger Lightning for (30%35% of Attack power) Nature damage. Power Strikes Every 15 sec, your next Tiger Palm generateswill generate 1 additional Chi and deal 200% additional damage. Serenity Enter an elevated state of mental and physical serenity for 89 sec. While in this state, you deal 40% increased damage and healing, and all Chi consumers are free and cool down 100% more quickly. Swift Roundhouse Blackout Kick has an additional 5% chance to critically strike, and deals an additional 125 damage. This tier doesn’t feel much different, but the extra chi from Chi Burst is noticeable. Currently the extra chi puts Chi Burst at the top of this tier for all situations. I didn’t mind having a little bit of a mix of movement and survivability on this tier. It allows you to take either two movement talents, or two survival talents, or a mix. This feels like you’d have more flexibility in what you’d use depending on the situation. Of all the tiers, this is the one I was most excited about changing. Energizing Elixir being down to 2 Chi, while technically a HUGE nerf, balances this talent tier soooooooooo much better. The fact that Energizing Elixir maxes out at 6 chi, compared to Power Strikes‘s 4 is still a notable difference, but no where near as big as it is currently where the difference is more like 11 vs 4 in perfect use. It will take some getting used to Energizing Elixir being so easily used, but overall a fantastic change all around. This tier is, more or less, all new; so I was interested in checking out. Unfortunately Fist of the White Tiger wasn’t working correctly, not providing the Chi, and Combo Breaker appeared to be on at all times, whether you had the talent or not. However, the one thing I can comment on with this tier is that Combo Breaker feels exactly how that proc should be; its impactful but not intrusive. Similar to my impression of Tier 2, I don’t mind having a mix of survival and movement on the same tier. Inner Strength does feel like a half idea right now, as it neither provides enough damage reduction in the best situation to make it worth thinking about and playing around, nor does it have a high enough uptime to make a noticeable difference with its lower damage reduction. One of those two things need changing, either more uptime, or more damage reduction. Rushing Jade Wind – Holy forking shizz… this talent feels awful. Potentially the worst gameplay I’ve ever played in WoW. The fact that it drains some energy feels fine, there’s no problem with that. The problem, and it sticks out like a thorn, is that if you are waiting for energy to regen so you can use Tiger Palm, using Tiger Palm as soon as you have enough energy will, depending on how much you’re spamming the button, mean that you don’t have that much energy for Rushing Jade Wind for that fraction of a second, and Rushing Jade Wind will turn off, meaning that you’ll have to wait till your next free GCD to turn it back on. Invoke Xuen, the White Tiger – Same feel, just a shorter duration and cooldown so less overall uptime. I hope my disdain for Rushing Jade Wind was adequately conveyed through that paragraph. If not, there’s definitely some choice words somewhere on the VOD from last night’s stream. This tier is mostly disappointing as only Rushing Jade Wind provides any meaningful change to how you play, and it plays like hot garbage. Something more needs to be done about this tier, but the potential is there. There’s not much to be said about this tier as it really isn’t much different from live, which is mostly OK.
No Strike of the Windlord – I didn’t notice it was gone except for during Serenity. Because of the CD reduction mechanic of Blackout Kick, there is enough to press for the resources you have without Strike of the Windlord. Blackout Kick reducing cooldown of Rising Sun Kick and Fists of Fury – Feeels goooooood. Not major enough to be game changing, but enough that its noticeable. Spinning Crane Kick costs 2 Chi – Feels more natural, just harder to “dump” chi. It feels much better when you drop Rising Sun Kick and Blackout Kick from the rotation. Also feels very nice with Power Strikes as it helps you have enough Chi for Fists of Fury without having to think about it much. You just alternate Tiger Palm and Spinning Crane Kick and Spinning Crane Kick when its up. Combined with Energizing Elixir, Chi Burst, Fist of the White Tiger, and other things, you’ll have a ton of resources for using Spinning Crane Kick often. Although I wasn’t overly miffed with 3 chi Spinning Crane Kick, this just feels right. Offensive abilities being on the GCD – Yeah, this doesn’t feel great. It will take some getting used to and planning around. Touch of Karma remains off the GCD since its “technically” a defensive. Leg Sweep and Ring of Peace being baseline is quite nice. Ring of Peace got its time in the sun during Antorus, so its nice to be able to play around with it in the future without it taking up a talent slot. Windwalker is still fun. Anyone who’s been around for a while may know my opinions and preference for how Windwalker should play. I prefer slow, paced, gameplay. Minimal spamming, more time for planning. This was what I enjoyed most about Windwalker at any time during the past 6 years. With that in mind, the current feel of Windwalker on Alpha is just about my dream situation. The choices you need to make are meaningful, but not complicated. Each ability and button press feels important. There’s both room for mistakes and room to really squeeze out a bunch more DPS. It is simpler than currently, and more user-friendly, without losing the feel or the complexity that makes many people love Windwalker right now. Hi, I’m Hinalover. I am a theorycrafter for Windwalker Monks, and the primary SimulationCraft developer for all Monk specs. I play in on US-Sargeras. Usually you can find me either on Twitter or in the Peak of Serenity Discord. I have been a part of the theorycrafting community since Wrath; ranging from Mages (during the Elitist Jerks days), to Feral Druids, and now Monks. It was my work with Feral Druids that I was privileged to be one of the developers for the program Rawr. At this stage of the Alpha/Beta, I tend to not look at number changes, but more of mechanic changes; especially this alpha given the stat and item level squish. However, the change to how melee damage is calculated by way of the weapon damage is probably the biggest back-end change for melee since the removal of Hit Rating and Expertise Rating. Now, this is not the first time that Monks have had an unusual weapon calculation. 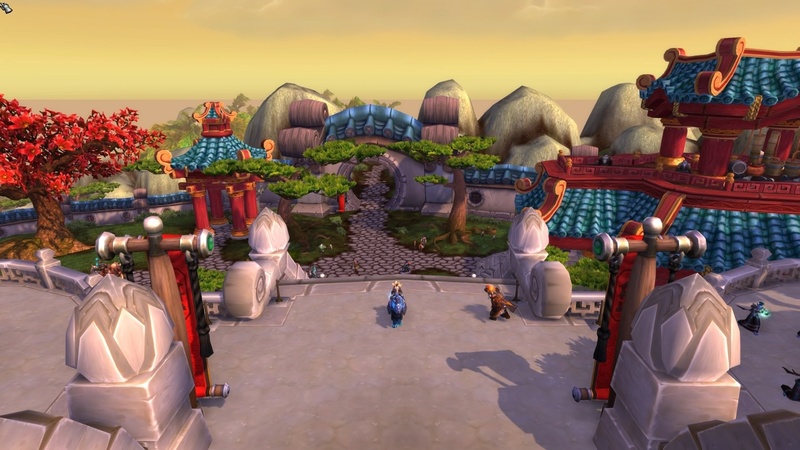 During Mist of Pandaria and Warlords, Monks had a convoluted weapon calculation so that players could use dual welding or two-handed weapons and not have much difference between the two. The same concept is now being applied to all melee specs. Currently only the main-hand weapon is being used for the calculation, but if you look at Blackout Kick, you will see that Blizzard is toying with the idea of giving off-hand dps some value. Personally, I see this as a test-bed that they can apply to all dual-welding specs (Windwalker Monks, Rogues, Enhancement Shamans, Demon Hunters, and Frost Death Knights). However, it could very well be that it’s to give something to Windwalker Monks, who don’t have an off-hand weapon attack; outside auto attack and Fist of the White Tiger. Overall, this calculation affects nearly all of the Windwalkers’ abilities. This include abilities performed by pets such as Storm, Earth, and Fire and Invoke Xuen, the White Tiger. Because of this, weapon DPS will be highly sought after. It’s too early to say if item level; whether it has Agility or not; trumps all. However, it is something some of us theorycrafters are keeping an eye on. In Battle for Azeroth, Windwalker Monks are not changing all that much compared from Legion. Our Mastery (Mastery: Combo Strikes) still has us mixing our abilities. However, the changes so far have revolved around the loss of our artifact and changes to our talent tree. Losing our artifact means we lost Strike of the Windlord. Thankfully we got the spell back in the form of the talent Fist of the White Tiger. Sadly, Fist of the White Tiger does not have a cleave component; similar to Strike of the Windlord; but instead provides a secondary effect that gives an on-demand chi generation for burst potential. Another trait that we lost but got as a talent is Tornado Kicks. The visual for this talent is probably why Blizzard chose to keep this ability. Seeing two Rising Sun Kick happen back-to-back is satisfying. Finally, in a recent build, we got Gale Burst applied baseline. I’m quite happy about this change since this now allows monks to have a sort-of burst window that was in a set and forget mentality. Other talents that are changing include the addition of Combo Breaker, Inner Strength, and Wind Strikes. Wind Strikes feels like it is the AoE component of Strike of the Windlord, but it does feel like it is a nice replacement for Chi Orbit. The main issue a lot of players had with Chi Orbit, was the unpredictability and impact of the spell. At least with Wind Strikes, we can control when it procs as well as who it hits; with a satisfying animation associated. Do I think it will compete with Whirling Dragon Punch or Serenity …. no. But I do think Wind Strikes is a good option for players who are not used to either of the other two options. Inner Strength gives an interesting, near constant damage reduction which could be useful in “constant damage” fights such as Varimathras. Combo Breaker is the odd-ball of the new talents. The issue is that Blackout Kick currently reduces the cooldown of Rising Sun Kick and Fists of Fury. So, having a talent that causes Blackout Kick! to also reset the cooldown of Rising Sun Kick may not feel impactful (given the low chance of the buff to proc). So, in a worst-case scenario, you could have Blackout Kick! proc when Rising Sun Kick is not on cooldown, thus wasting the talent. I could see Blizzard changing this talent to say something along the lines of having the next Rising Sun Kick to not go on cooldown when Blackout Kick! procs. It’s not listed directly in the spell changes, but Windwalker Monks are keeping both Leg Sweep and Ring of Peace baseline; unlike Brewmasters and Mistweavers who have to talent into Ring of Peace. This is great for our crowd control abilities. Though it is disheartening that Paralysis has had its cooldown increased from fifteen seconds to one minute. But given how other crowd control for other specs have had their cooldowns increased is probably good for the game. As for other talents, I personally like the fact that Energizing Elixir is now only giving two chi compared all of your chi. The spell was too strong in Legion and needed to be brought down. It’s also nice that both Ascension and Power Strikes were buffed and appear to be viable options. On the topic of Healing Elixir and Chi Torpedo switching places. I am fine with the change since it forces me to choose what talents are best for a certain fight. If am going against Mythic Aggramar, I’ll want more defense, so I’ll probably go with Healing Elixir and Inner Strength. Eonar needs a lot of movement so I’ll probably go with Celerity or Tiger’s Lust and Chi Torpedo. Or any combination of the six talents. Finally, the one talent that I wanted to talk about was Rushing Jade Wind. The tooltip may sound strange but the way it works is similar to Breath of Sindragosa for you Death Knights out there; or Fury of Air for you Enhancement Shamans. But basically, after activating the spell it continues swirl around you, but at the cost of energy generation. You can toggle the spell off after six seconds. What this means is you can keep this spell going almost indefinitely, but at the cost of slowing down your chi generation. As of the current build most people are only using it for burst damage or if they have a lot of chi built up for spending purposes. I personally find the cost of the ability too excessive if they are aiming for an ability similar to Fury of Air and could see this abilities’ cost reduced to one or two energy per second. If that becomes the case, I could see this ability being tied with Ascension for the energy generation bonus. If Blizzard does change cooldowns to have their own cooldown GCD, then I could see the rise of /castsequence which is something I don’t think Blizzard wants. Champion of Azeroth seems like a decent leveling trait. The premade gear set; which is equivalent to about 880 item level on live has about 12,000 HP. So at the lowest level, 624 HP is not that bad per mob killed. Combine that with Afterlife could provide for quite a bit of healing while leveling. Iron Fists maybe more designed for dungeon farming since you will tend to have mobs grouped up. This is generally not the case while questing. I think the condition of having four mobs as the trigger maybe excessive since it would be useless in single target or cleave situations. Sunrise Technique seems almost generic since it just gives Rising Sun Kick extra damage. How this applies to Tornado Kicks maybe of interest but I suspect the proc is only on the initial Rising Sun Kick and not the second Rising Sun Kick. The rest are just interesting choice that any spec could use…yes even Woundbinder since your level 15 talents can trigger it. But overall, I’m hopeful on this new system. My name is pandanaconda, a long time raider in Myst on Draenor-EU. I’ve been part of the theorycrafting concerning windwalker in the past 3 years, and co-founded peakofSerenity.com, where I keep up article. You can occasionally see me on twitch.tv/pandanacondda_hs or contact me through discord. The first big change on alpha is the absence of artifact traits. This might sound obvious, but many of us have forgotten how much this influences the balance of the spec. The loss of Spiritual Focus and Split Personality greatly affects the way Storm, Earth, and Fire and Serenity will behave. So many things are going away, including all tier options, legendaries we have gotten used to, Strike of the Windlord… This puts us back in the baseline rotation, which can be highly misleading. We have no clue how many other shenanigans will shake the windwalker spec in Battle for Azeroth. As things are still very indecisive and are bound to change a lot, I will not go in depth on everything, but will rather focus on specific topics I would like to address. Class designers have taken a turn in the right direction concerning many talents. They’ve correctly acknowledged that some talents where either irrelevant (Chi Burst comes to mind) or so much stronger than their competition there was no reason to ever not pick them, Energizing Elixir for instance. Both of those talent rows were changed significantly. Although balance is far from properly done right now, at least it means they have their eyes on these. In the meantime, we’re seeing some significant changes regarding two very controversial talent rows, level 90 and 100. Rushing Jade Wind is receiving a large revamp, Invoke Xuen, the White Tiger is getting some attention as well so we can hope to see some diversity in that row. Finally, they got rid of the infamous Chi Orbit in favor of something equally as passive, which makes me think that level 100 row is going to remain the same debate as it’s been for all of legion. For what it’s worth, it has worked out fine that both talents have been competitive an equal share of the expansion. With each expansion, blizzard tends to rebalance the amount of Area of Effect spells available to each spec. In WoD, it was quite hard to come by good burst AoE, and for that reason Demonology and Warriors ruled that topic. In legion, most specs had access to several strong AoE tools and windwalker was no exception. It looks like they are going back to weaker AoE tools across the board. Fists of Fury’s AoE component getting halved will hurt our cleave badly, the mark of the crane effect gets a 75% nerf. This changes a lot about the dynamics of windwalker, but in my opinion encounters and dungeons will reflect upon the availability of AoE tools anyways. The nerf is huge across most specs, so we shouldn’t expect to be left out. Getting one chi per target from Chi Burst and the changes to Energizing Elixir will heavily impact the dynamics of AoE. Spinning Crane Kick being down to two chi will change a lot on AoE anyways. These changes are healthy if the tuning goes along smoothly. We have a few changes which look underwhelming but matter a lot. The small change to Blackout Kick, which now reduces your other small cooldowns by 1 second, is going to help a lot in making sure your rotation doesn’t get clogged up with more resources. I’m expecting a lot from this change, although outside of Serenity it’s much smaller than people might think it is. This goes in the right direction. Serenity is going to be extremely potent on AoE with the nerfs to mark of the crane specifically; the change to Blackout Kick doesn’t have too much of an impact right now due to how strong Spinning Crane Kick is baseline, but we’ll see about that with tuning. If it’s going to be easier to spend resources and Energizing Elixir isn’t as strong as it used to be, there will be much more room for Serenity to shine than, for instance, during tier 21. We’re also getting some more love. Leg Sweep and Ring of Peace are BOTH becoming baseline tools. Gale burst is getting baked into Touch of Death: although this might be controversial due to gale burst’s tendency to double dip, people have enjoyed Touch of Death being more than a large chunk of burst, no matter how small the set up is. Hello readers! Je m’appelle Talby, World of Warcraft MVP, author and moderator for the Peak of Serenity. Legion came with a big redesign for Windwalkers and in Battle for Azeroth that redesign is getting some much needed polishing. Strike of the Windlord, gone to soon from our hearts with the removal of our artifact, the Fists of the Heavens. Losing the artifact will have a big impact on Windwalker as a specialization that was redesigned for the expansion that introduced it. We will be moving into Battle for Azeroth without the damage increasing passives of Fists of the Wind, Dark Skies, Power of a Thousand Cranes and most importantly the traits tied to our cooldowns Split Personality and Spiritual Focus. Consequently, each respective cast of Serenity or Storm, Earth, and Fire will be weaker baseline by 5% in the future and on a longer cooldown. Rising Sun Kick will be losing a lot of power with the removal of both Rising Winds and Tornado Strikes. The additional energy from Inner Peace will be gone along with Good Karma and Healing Winds, the traits tied to the healing effects of Touch of Karma and Transcendence: Transfer, leaving us with a small maximum energy pool and an expensive Tiger Palm along with no way to reliably heal outside of spamming our extremely weak casted heal, or by killing an enemy and picking up an afterlife orb. This will undeniably slow down the pace of combat a great deal given what we have grown accustomed to throughout legion. While this may not sound great, the core of the specialization remains and the play style that we have grown to enjoy is still here and being polished further in Battle for Azeroth. If you’ve been playing Windwalker since the start of Legion then you have probably noticed the fine tuning changes and polishes to the gameplay that we’ve gotten leading up to now such as the Storm, Earth, and Fire A.I. changes and the list of fixes to a large number of bugs during Emerald Nightmare / Trial of Valor. Towards the end of Nighthold we saw a huge re-balancing of damage sources to move a large portion of our output from AoE to single target damage that helped smooth the transition between AoE and single target damage and helped facilitate a unique playstyle for both Serenity in Tomb of Sargeras and Storm, Earth, and Fire in Antorus. I’m very happy to see that these ideas are being explored for the future. Cyclone Strikes, the debuff per target associated with Mark of the Crane, was reduced in effectiveness per stack and Spinning Crane Kick’s chi cost was reduced from 3 to 2. Fists of Fury once again deals half damage to additional targets hit to finally remove it from the AoE toolkit which is a huge change and a very welcome one in my opinion. Conflicting cost of both Fists of Fury and Spinning Crane Kick often made it hard to decide when the time spent channeling one was more valuable than building stacks for the other. Whirling Dragon Palm added more complexity to the decision requiring you to use single target abilities during AoE. Chi Burst and Rushing Jade Wind as a result were rarely worth picking up due to the overabundance of better AoE abilities in the toolkit during Legion. Invoke Xuen, the White Tiger found himself also struggling as a talent, unable to keep up with the ever increasing value of Hit Combo. With the windwalker damage aura including all of our major damage abilities and set bonuses building further on the power of each ability, Hit Combo scaled extremely well each time as a side effect leading to it dominating the tier while the kitty’s power increased very slowly. In Alpha currently Hit Combo has been reduced to 1% per stack and Invoke Xuen, the White Tiger is getting stronger cleave, a shorter cooldown, and a shorter duration. Energizing Elixir will only generate 2 chi allowing for talent diversity in those rows. Artifact Traits that we’ve lost are being re-added as talents or baked-in, such as Gale Burst and Tornado Strikes along with redesigns to weaker talents such as Ascension now providing an additional +20 energy and Chi Burst generating chi for each target hit. Leg Sweep and Ring of Peace will now be baseline and seldom picked talents like Chi Orbit are getting removed to make room for new talents. We’re going to see a much more diverse range of builds as a result of these changes since each talent choice in a row will be much more significant than they currently are. The most interesting change by far for Windwalker utility will be the addition of Mystic Touch which is going to have a huge impact on raid encounters and dungeon content. Battle for Azeroth is certainly looking very appealing and I think that with the right tuning Windwalker will be in the best place it’s been since release. NEW Mystic Touch Your damage exposes weaknesses in the target’s armorweakens the target, increasing Physical damage taken by 5% for 1 min.5%. Blackout Kick Kick with a blast of Chi energy, dealing (385% of Attack7700 / 10000 * Spell power) Physical damage. Windwalker – Reduces the cooldown of Rising Sun Kick and Fists of Fury by 1.0 sec when used. Crackling Jade Lightning Channel Jade lightning, causing (170.8%27.977% of Attack power) Nature damage over 4 sec to the target and sometimes knocking back melee attackers. Paralysis Incapacitates the target for 1 min. Limit 1. Damage will cancel the effect. Soothing Mist Heals the target for (3600%900% of Spell power) over 20 sec. Brewmaster, Mistweaver: Spin while kicking in the air, dealing 122%16.38% of Attack power)] damage over 1.50 sec to enemies within 8 yds. Windwalker: Spin while kicking in the air, dealing 122%16.38% of Attack power)] damage over 1.50 sec to enemies within 8 yds. Windwalker: Spinning Crane Kick’s damage is increased by 40%10% for each unique target you’ve struck in the last 1.50 sec with Tiger Palm, Blackout Kick, Rising Sun Kick, or Rushing Jade Wind. Tiger Palm Attack with the palm of your hand, dealing (128.1%27.027% of Attack power) damage. Transcendence: Transfer Your body and spirit swap locations. Chi Wave A wave of Chi energy flows through friends and foes, dealing (86.7%24.57% of Attack power) Nature damage or (86.7%14.2015% of Attack power) healing. Bounces up to 7 times to targets within 0 yards. Leg Sweep Knocks down all enemies within 5 yards, stunning them for 53 sec. Admonishment Intimidates the target, increasing their damage taken by 5%3% for 6 sec. Each unique player that attacks the target increases the damage taken by an additional 5%3%, stacking up to 5 times. Your melee attacks refresh the duration of Intimidated. Guard Guard allies within 15 yards for 15 sec, allowing you to Stagger 30%20% of damage they take. Hot Trub Purifying Brew deals 50%30% of your purified staggered damage to all enemies within 10 yards. Way of the Crane Increases your Physical damage by 50%35%, you remove and become immune to all stun, snare and root effects and you heal up to 3 nearest allies for 175%200% of all damage done. Lasts 15 sec.